SharePoint is a repository of information and often times that information needs to be shared either through a print out or email. Infowise offers the Smart Print Pro to make styling print templates practical and intuitive. One extremely useful feature that comes with Infowise Smart Print Pro is the ability to print Calendar views. 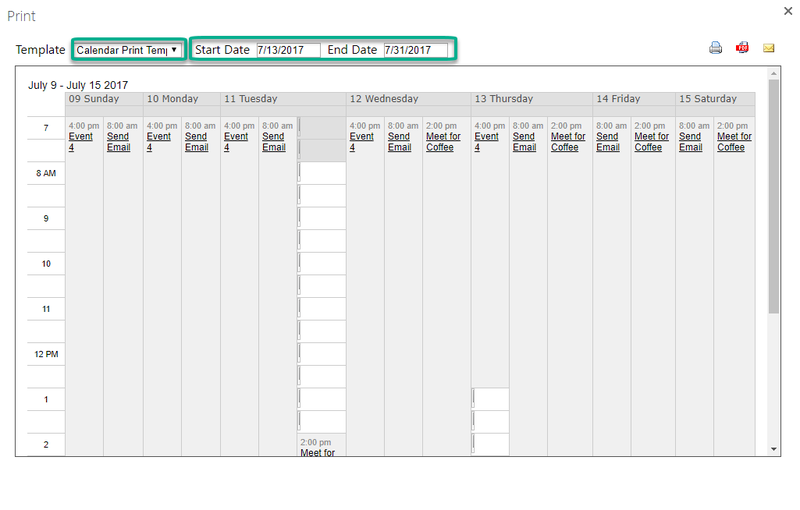 First, we will walk through setting up a Calendar Print Template in the Office 365 version of Infowise. 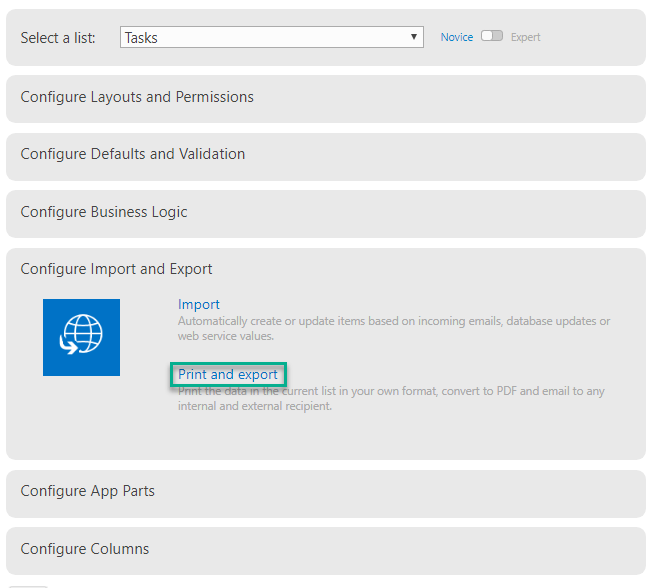 Navigate to your Infowise Design Screen of the list you would like to print and select Print and export under the Configure Import and Export section. Now give your Print Template a descriptive name and select Calendar from the Type dropdown. Once Calendar type is selected, Infowise will ask you to set the columns for Title, Location, Start and End Date below. 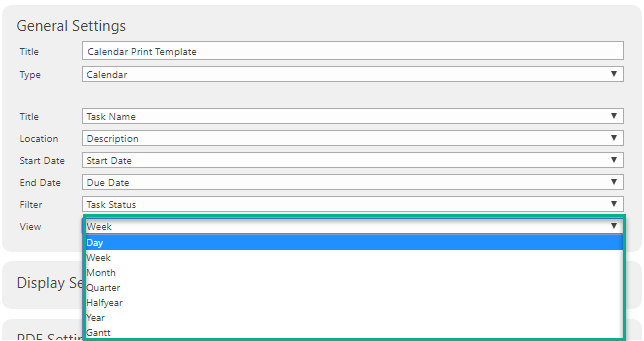 The Filter section allows a user to Filter the data source based on a selected column. We will circle back to that in a bit. The View dropdown offers number of different ranges for us to select from and we will discuss it more later in the article. Choose the one that suits your needs best and remember to click Save at the bottom of your screen. Once saved, you should see your new template appear in the Print Templates section at the top of your screen as seen below. Next, navigate to your list and select some records you wish to print and click the Print button in the List tab above. Infowise will open a popout window that should look similar to the below image. Notice that Infowise offers us the ability to scroll between templates as well as to change date ranges. An additional settings that is offered under the General Settings tab is the Filter feature. 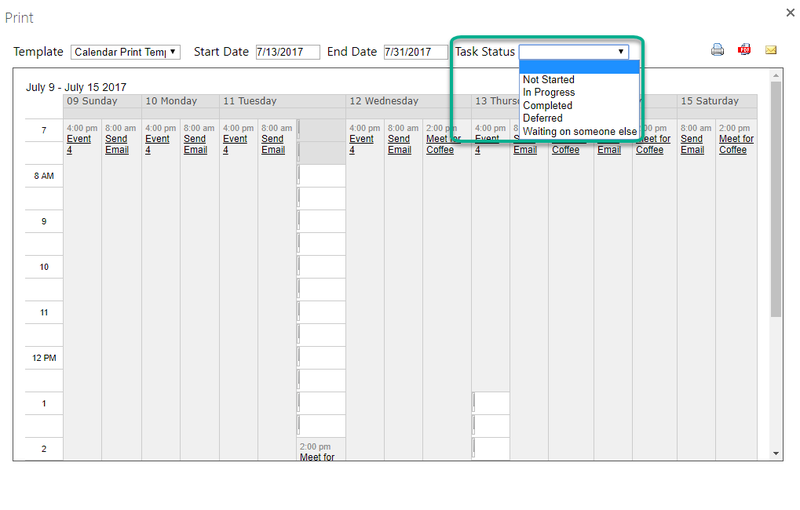 The Filter drop down allows us to select a column from our list that we want our user to be able filter on in real time. To demonstrate, I will go ahead and choose a column from our list, in this case Task Status, and lets see what effect it has. Make sure to click Save at the bottom of your screen to update your template. Now lets navigate back to our list and once again select some items to print. 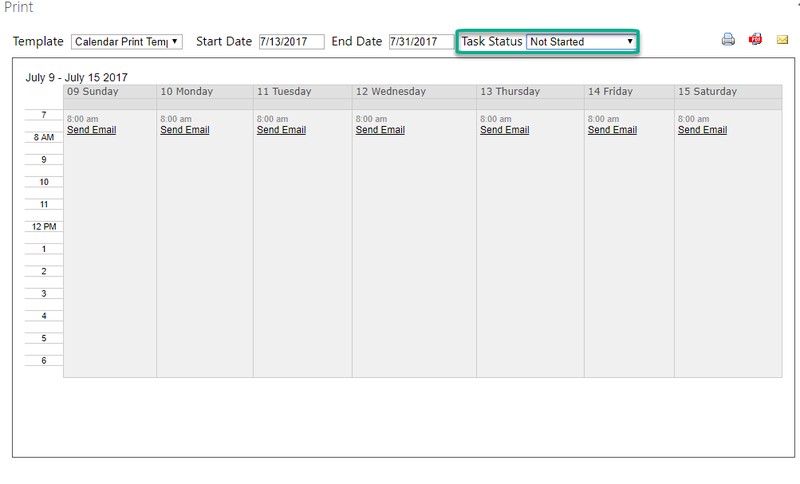 We can see that now our Print Screen offers a Task Status filter next to our Start and End Date columns. If I select Not Started as a Task Status in my filter, the records in my calendar below are filtered accordingly. One final setting in our General Settings tab is the View setting. Infowise offers seven different views. Previously this was set to the Week view. It is easy to setup multiple Templates with different views depending on what we want to accomplish. Here is our exact same list with the Quarter View selected. We can see how it would be valuable to create multiple Print Templates specific to each view. 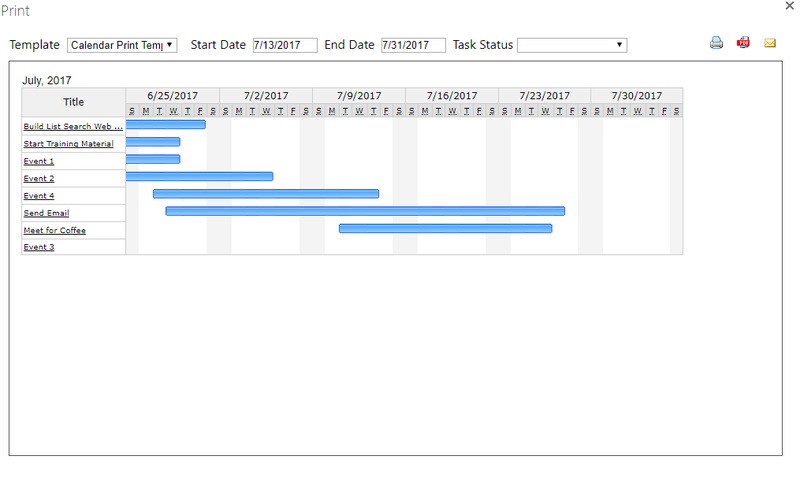 Lets also take a look at what our Print Template looks like with the Gantt View enabled. We can see how this easily sums up our list and provides insight into our list for our users. In this example, we walked through setting up an Infowise Print Template. We discussed enabling features such as Filter and the various types of Views that come standard in the Infowise Suite. 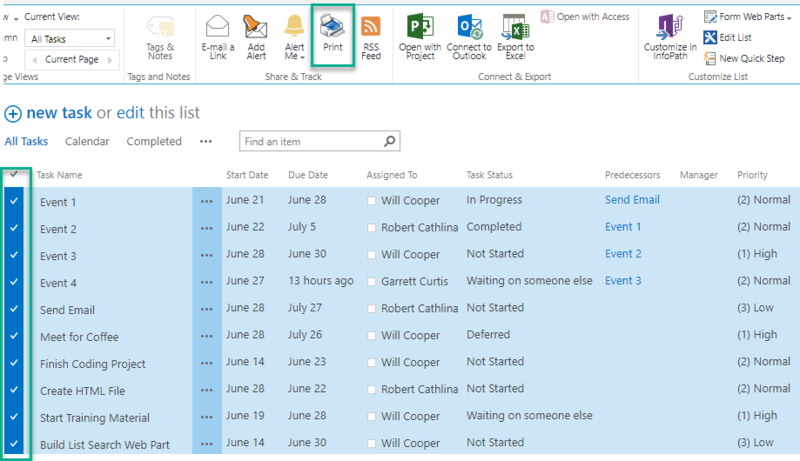 Infowise Smart Print Pro allows us to define standard print, PDF and email settings for our SharePoint lists so that users can easily format and share information.